IMAGINE TAKING a trip through the history of everything from the beginning of the universe to the present day! 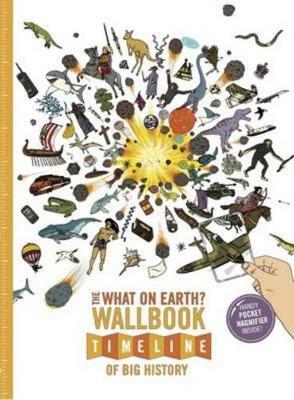 This unique 'big history' wallbook includes a 2 metre-long fold-out timeline containing more than 1,000 pictures and captions that tell the story of the history of the world. The timeline is divided into 12 sections covering both natural history as well as the history of human civilisations in each of the world's continents. Readers can easily compare what was happening across the world at any given moment in time. The Wallbook also includes the Wallbook Chronicle which reports on more than 30 key moments from the timeline in the style of a newspaper. Also includes a crossword, letters to the editor, 50-question quiz and pocket magnifier. Perfect for 7-14 year olds but equally fascinating for all curious adults.